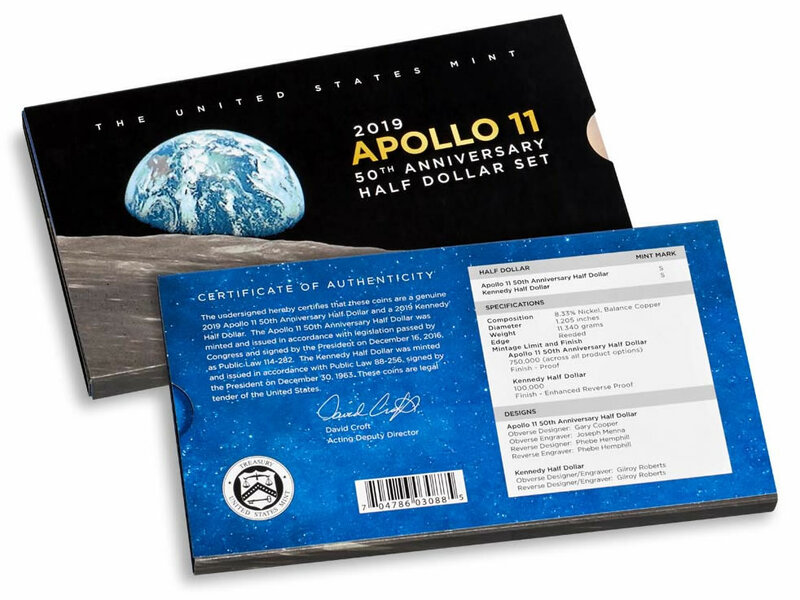 The Apollo 11 50th Anniversary Half Dollar Set has a packaging error that will be corrected, the United States Mint said in a statement Tuesday, Jan. 29. As highlighted in this U.S. Mint image, the outer sleeve of the Apollo 11 50th Anniversary 2019 Proof Half Dollar Set shows Gilroy Roberts as designing and engraving the reverse of the Kennedy 50c. It should credit Frank Gasparro. The back of the outside packaging sleeve incorrectly shows Gilroy Roberts as designing and engraving both the obverse (heads side) and reverse (tails side) of the Kennedy 50c. Roberts designed and engraved the obverse but Frank Gasparro designed and engraved the reverse. "Approximately 70,000 units were shipped before the error was discovered. Plans to reprint sleeves with the correct information are underway," the Mint said. "Instructions for ordering corrected sleeves will be made available at a later date." Further shipments of the sets will be delayed until corrected packaging is on hand, the Mint said. Priced at $53.95 and released Jan. 24, the set is one of eight U.S. Mint products that celebrate the 50th anniversary of the first manned landing on the Moon. It contains a proof Apollo 11 half dollar and an enhanced reverse proof Kennedy half dollar. Figures through Jan. 27 show 69,155 of the maximum 100,000 sets have sold. Interesting…I have 5 sets already in route so they likely have the error printing. Does this mean one should keep the coins in the original packaging rather than getting them graded? At 70,000 shipped out of 100,000 limit is the error material? Wonder if the grading companies will start having a ” SPECIAL, LIMITED EDITION RARE U.S. MINT ERROR” label for this label!?? I’m sure there’s someone out there that will take the bait and some TPGs will provide that bait. It would have been great if there was a legitimate error on the “coin” and not on the worthless label. I don’t see much of a market for it but I am sure someone is designing a slab for the sleeve as we speak. If the error was on the coin it would be like gold but this is just a printing error. My coins including the 5 oz coin are out for delivery. So, I’ll buy the correct one, only 30k available- 70k of the ‘error” ——– really who cares!!! Packaging is not the coin. This has no value! No, no per Mike Mishak, but the holder, not the coin…. You mean buy the holder, not the coin. HSN and others push the package as being more important than the coin. As Mel Brooks said, it is merchandizing. I just ordered 3 of the sets this morning (February 1) and got a response that they have already shipped. Based on the above report, doesn’t that mean the Mint has fixed the packaging issue? Or did they just say they would not ship new orders but do it anyway? If a coin set has a written error on the holder will ANYONE care.. staye tuned,as I said the mint did not correct as the 30k right ones would be the “rare” ones…. I ordered the set after the announcement that the packaging had the wrong information about the designer of the reverse of the Kennedy half. The set came today, with the error still on the packaging. Has that happened to anyone else? Apparently the mint is still sending out the incorrect information. The coins themselves are beautiful.